Sick of tea yet? A little? I’m not, but I made something reeeally good for dinner last night and thought the internet might be interested! I saw a yummy-looking dish over at the kitchn, and decided that before the Meyer lemons disappeared for the rest of the year I’d have to make it. So I bookmarked it, and thought of it any time I had some lemons or passed the mascarpone in the store. But only a little…and every time I thought of it, my brain changed it, like a game of telephone. Hello, food. I miss you. 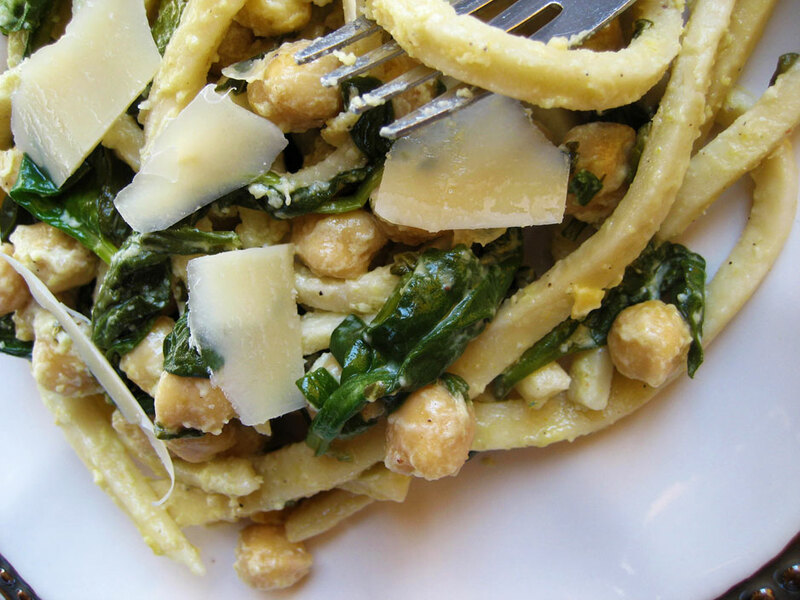 And what was once Meyer lemon, mascarpone, spinach, hazelnuts and spaghetti turned into Meyer lemon, mascarpone, spinach, fresh basil, chickpeas and fresh homemade pasta. Those are some fat noodles! I haven’t made pasta before, aside from the last Daring Bakers Challenge, but really wanted to practice making it some more. I originally intended to make fettuccine, but since I don’t have a pasta machine I did everything by hand and couldn’t get the dough thin enough. In fact, I’m going to mix the dough in my Kitchenaid the next time I make pasta. I don’t have the height or the strength to knead pasta dough as well as I’d like. Even though the pasta took some effort, I think this was worth it, and letting the dough rest every once in a while over the afternoon helped a lot. Then all I had to do was zest and juice the lemon and cook everything up together! Giant flakes of shaved parmesan are optional, but extra-good if you like things extra-cheesy. Sift the flour onto a clean work surface. Make a well in the middle and add the eggs and salt. Using clean hands, combine the eggs and flour, making sure not to let the eggs escape. Do your best to knead the ingredients into a cohesive dough, and dribble a few drops of water onto the dough as needed to help the dough form. Continue kneading until you have a smooth ball of dough. OR, do this in a stand mixer with the dough hook attachment. Allow the dough to rest, lightly covered with plastic wrap for 1-3 hours. Divide dough into fourths. Use a rolling pin (preferably a pastry roller) to roll the pasta dough out as thin as possible, allowing it to rest for 10 minutes at a time if it becomes uncooperative. Or roll out in a pasta machine. If not using a pasta machine, cut into thin noodles with a long, sharp knife. Lay noodles out flat on the work surface, or hang, until dry. Set a medium-large pot of salted water on to boil. Combine lemon, basil and cheese in a small bowl and mix well. Once the water boils, add the pasta and cook for 3-5 minutes, or until cooked through but still firm. Set aside about 1/2 cup pasta water and drain the pasta. 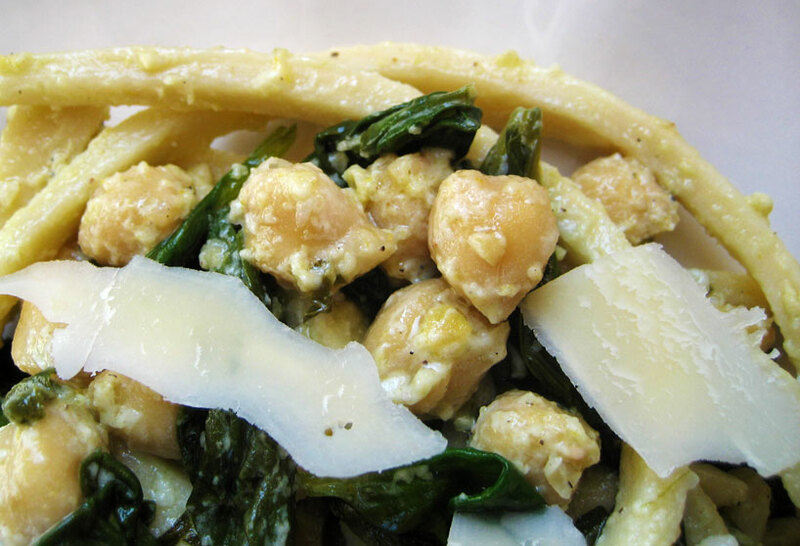 Return the pasta to the pot over low-medium heat and add the lemon-mascarpone mixture and chickpeas, then add the spinach a handful at a time, stirring constantly. Once the spinach is wilted, season with nutmeg and pepper, sprinkle with shaved parmesan and serve immediately. I would definitely make this again, and I definitely recommend it to anyone who likes pasta, lemon, cheese, basil…basically everything awesome. You could use a different bean or a nut in place of the chickpeas (pine nuts would be yummy, or pistachios…ooh or cannellinis) but I’d probably use the chickpeas again because they are truly the greatest beans. 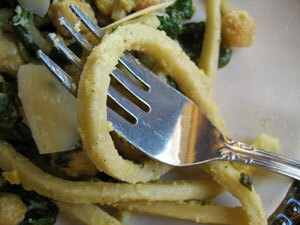 I love making home-made pasta and it does get easier the more you make it.